The normalization of cannabis use for adults across America continues with no end in sight. As a result, increasingly savvy consumers are seeking reliable and consistent cannabis products to meet those needs. This is especially true in state markets where adult recreational use has become a growing and accepted part of the culture. We don't think the demand for reliable products is being met yet, especially in food and beverage. With expanding acceptance and the industry just in its infancy, this is a good time to bring modern production and distribution solutions to exploit the growing demand for this old but still very popular product. Cannabis has two active chemicals. There's CBD, which can both act as an antioxidant and help with relaxation. And then there's THC, a psycho hallucinogen, which is where the rubber really meets the road for impact. These products have many applications from vaping, food, beverage, supplements, pharmaceutical and wellness products. From a beverage perspective, beverage alcohol is not mixed with THC cannabis as its combined effects can be dangerous. However, mixing with CBD could be beneficial. A popular way to consume cannabis is through edibles, which are generally positioned to women based on current consumer research. 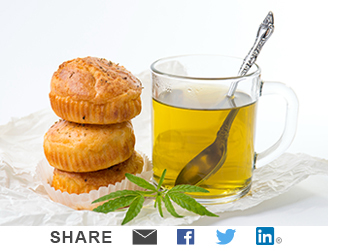 The industry in some cases is treating cannabis like a food, suggesting parings with different meals. This pairing strategy certainly has worked with cocktails, wine and craft beer and we see a genuinely interesting opportunity for cannabis here. Although data is mixed at this point, it is believed that cannabis will generally have a greater negative impact on beer than wine and spirits. This is likely due to age demographics as beer drinkers tend to be younger. However, for non-alcoholic beverages, the growth of cannabis acceptance does appear to offer a good opportunity in both CBD and THC forms.